"Pumpkin pie in a scone - very tasty! I make this free-form without using cutters." Combine all-purpose flour, whole wheat flour, brown sugar, baking powder, baking soda, cinnamon, salt, nutmeg, and allspice in a large bowl. Cut butter into flour mixture using a pastry blender or 2 knives until mixture is crumbly. Stir raisins into flour mixture. Whisk pumpkin, egg, and buttermilk together in a bowl; stir into flour mixture until dough is well mixed. Pat dough into a 3/4-inch-thick circle on a lightly floured surface. Cut dough into 14 scones using a 2-inch round cutter and transfer to a baking sheet. Brush tops of scones with egg white. Bake in the preheated oven until a toothpick inserted in the center comes out clean, 10 to 12 minutes. Transfer scones to a wire rack to cool completely. 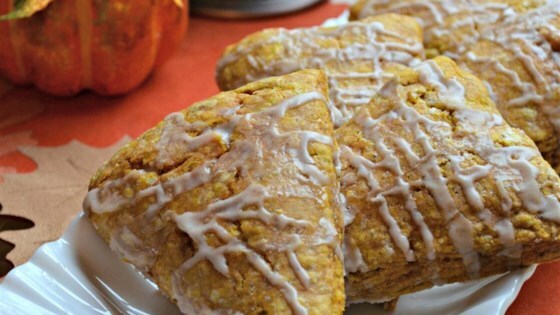 Put a tasty twist on classic pumpkin scones. Milk or water can be used in place of the buttermilk, if desired.